What is Hot Rod Paint? The automotive industry has adopted the name Hot Rod Paint to reflect the use of low gloss finishes on vehicles including cars, trucks, buses, and motorcycles. These finishes offer a unique look when compared to the traditional high gloss finishes which dominate the automotive exterior finishes market. As such they have seen a surge in popularity in recent times. In fact, many major car manufacturers are now offering hot rod black paint and some colors as an option on many of their models. While the popularity has been increasing, the general public still has minimal understanding of the complexities involved with finishes of this type. We hope this helps people considering these finishes as a customization on their vehicle. First, let’s address the types of hot rod black paint and colors and then we will move on to gloss sheens. Generally speaking Hot Rod Black Paint is available in urethane, enamel, and lacquer. Urethane products tend to hold up the longest but are a little more expensive. However, when you look at the amount of effort involved to get to thepoint where it can be painted a few more dollars for something that lasts longer does not seem to bad. Generally the urethane products are $40-100 more per gallon than the enamels or lacquers so we aren’t talking about a “take out a new credit card to pay for it” difference. Beware of products that say they can also be a primer. While the “primered look” is also another name for hot rod or matte black car paint finishes, you don’t have to settle for primer anymore. Primers are typically not built for sun exposure so they will often fade faster than a product designed with the proper resins and UV absorbers for direct outdoor exposure. 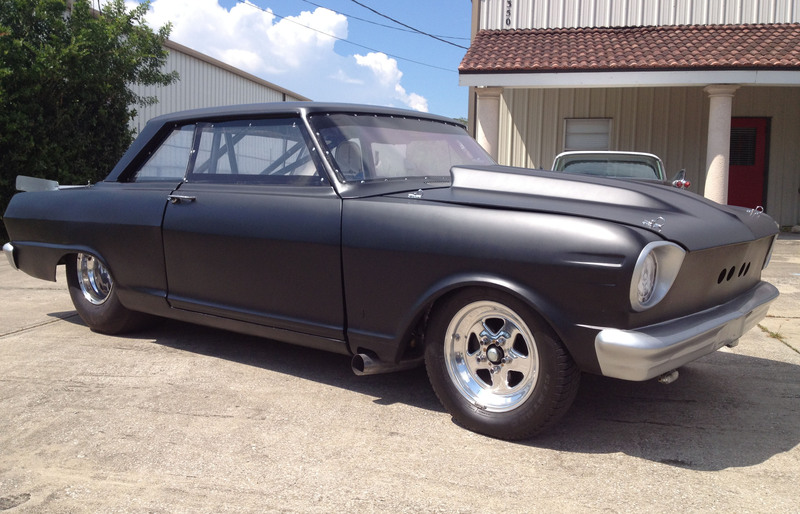 Gloss sheens seem to be all over the board when it comes to hot rod black paint. Flat Black car Paint, Matte Black Car Paint, Satin BLack Car Paint, and Semi Gloss car paint are all kind of lumped into one category called hot rod black paint. The difference between a flat black look and a semi gloss look are night and day. Be sure to evaluate which one you like the most and specify that be used when dealing with your paint shop or auto dealer. There are some nice photos of the various sheens on the “gloss sheens” page on this site. All the sheens have a cool look you just have to find the one or ones (yes, you can two tone with different sheens) that work best for you. Maintenance is one of the downsides of hot rod black paint. Because it is a low gloss finish any oily residue on it makes it appear glossy in that area which you can spot much more readily than over a gloss finish. This is easily corrected by cleaning the vehicle. The glossier sheens like satin and semi gloss are less susceptible to this than the lower gloss flat black car paint or matte black car paints. General dirt and road grime is not necessarily any more noticeable than over gloss colors although it often takes a little more elbow grease to remove them than over a gloss finish. Unfortunately, it is quite difficult to polish out a hot rod black paint since anytime you try to polish it will make the poished area more shiny than the rest. This makes it more challenging to fix minor scratches and marks that typically can be removed on gloss finishes during a good buff and detail job. There are a lot of brands available now that offer a hot rod black paint both at your local auto paint dealers and through online purchases. Be sure to find un-biased reviews on the products and if possible find people have used it before. Cost is not always a good indicator of quality. Some of the less expensive brands will often work just as well as the name brand so do your homework and you are more likely to have a good experience and save some money in the process.